Beginning to change your nutrition habits can be overwhelming. But have no fear, BeyondFit is here to help by sharing tips to make a healthy grocery list! With the right foods in your pantry and refrigerator, you set yourself up for nutritional success all week long. When it comes to stocking your fridge, freezer & pantry with healthy, fat-loss friendly options, you want to focus primarily on the 2 P’s: protein + produce. One egg contains 6 grams of high-quality protein and all 9 essential amino acids. And no, you need not fear the yolks… Regular consumption of two eggs per day does not affect a person’s lipid profile and may, in fact, improve it, as research suggests that it is saturated fat that raises cholesterol rather than dietary cholesterol. In addition, one egg yolk contains about 300 micrograms of choline, an essential nutrient that helps regulate the brain, nervous system, and cardiovascular system. Eggs are packed with protein and are great in protein pancakes, healthy baked goods, and more. And of course, scrambled eggs, egg muffins or omelets are a quick, comforting meal any time of day. Stock up on low sugar fruits and plenty of fibrous veggies (both fresh & frozen). I love to get broccoli and cauliflower, frozen blueberries, strawberries, etc (Check out Jackson’s blueberry request in the video above) and other grab and go produce items. I put apples and baby carrots in the crisper and always keep some tomatoes and onion in the fridge for recipes throughout the week. Make an instant meal with pre-washed greens for the base of a big salad with sliced chicken or another protein source on top. Serve greens as a “bun substitute” for sandwiches, wraps, and burgers (just wrap and eat!) and for extra nutrition you can even toss baby spinach into soups and stews, omelets, frittatas, and casseroles. Unsweetened almond milk is my go-to for morning protein shakes. In addition, it’s a great replacement in recipes that call for whole milk, half-and-half, or heavy cream. Eat it alone, with fresh fruit, or add it to protein shakes. I love to use Greek yogurt as a fat substitute in bakery recipes such as muffins, cakes or brownies, and it even works as a high protein substitute for sour cream or frozen yogurt! Thaw the number of pieces you need, when you need it. Serve as your main course, or use smaller amounts for a salad or stir-fry. Studies show that the unique fats in fish, especially fatty fish like salmon are able to lower the level of unhealthy fats in the body. In addition to aiding fat loss, fish oils improve immune function, reduce inflammation, and decrease blood pressure. Fish usually cooks very quickly, so it’s great to have in a pinch. Broil it for your main dish with salsa on top, or grill on your stovetop for a quick dinner, it’s great with a side of steamed veggies. Low sugar fruits have a higher water content compared to sugar and also offer fiber that helps balance hunger, energy, cravings, and the insulin/estrogen releases. A few bags of low sugar fruits like strawberries or blueberries in the freezer means you don’t have to worry if they’re fresh. We add frozen fruit to protein pancakes, oatmeal/oat bran, protein shakes and more! Turkey is a rich source of protein. Skinless turkey is low in fat and turkey meat is a source of iron, zinc, potassium and phosphorus. It is also a source of vitamin B6 and niacin, which are both essential for the body’s energy production. Regular turkey consumption can help lower cholesterol levels. The meat is low-GI and can help keep insulin levels stable. Turkey contains the amino acid tryptophan, which produces serotonin and plays an important role in strengthening the immune system. It is also a source of selenium, which is essential for thyroid hormone metabolism. It also boosts immunity and acts as an antioxidant. I always have some ground turkey on hand for chili, meatloaf or even lasagna. Beef is another rich source of protein and promotes healthy red blood cells. Your red blood cells require hemoglobin–an iron-containing pigment protein that gives your blood its color–to carry oxygen. If you don’t get enough iron from your diet, you might develop anemia due to an inability to make functional red blood cells. Iron also makes up a component of myoglobin, a protein that stores oxygen in your muscle cells. A 3-ounce serving of 95 percent lean ground beef or eye of round roast beef contains 2 milligrams of iron–11 percent of the recommended daily iron intake for women. I make sure we always have this on hand for chili, meatloaf or for burgers. When it comes to high fiber veggies, you can’t eat too many! In addition to providing your body with lots of fiber, vitamins, and minerals, cruciferous vegetables (like broccoli, cabbage, cauliflower, kale) are known for being estrogen detoxifiers. When looking to balance insulin and estrogen levels in women seeking fat loss, fiber is a great tool to help lower insulin and aid in removal of possible estrogen metabolites. Steamed, raw or roasted, fibrous veggies are great power foods that you can keep cut up and ready for snacking and cooking. Stock your favorite vegetables in the freezer and serve at least one vegetable with every dinner. Microwave frozen veggies and serve them as a side dish topped with your favorite spices. Put veggies and fish together in parchment or aluminum foil with a little orange juice. Add to rice, pasta, stews, casseroles, chowder, or chili. With the same low sugar content and less sodium than egg white powder, whey proteins are naturally high in BCAAs that are easy to digest. It immediately supplies the muscles with high quality protein, which directly correlates to an increase in physical performance and enhanced body composition. Keep whey protein powder handy and simply stir a scoop into 8 ounces of unsweetened almond milk or water for a quick and easy fat-loss power snack. Just reheat, or briefly heat with water, already cooked varieties. Consider buying a rice steamer for a no-hassle way to use uncooked rice. Serve as a complex carb side dish alone or mixed with veggies or tomatoes. You can also cook other whole grains like quinoa in a rice steamer. Click here for a quick video to learn how to eat carbohydrates for fat loss. Oat bran/meal cereals are a fast, healthy breakfast or a mid-day snack. Use oats as a crunchy topping for a greek yogurt parfait or make gluten free fruit & oat bars. I also love to grind my own oats into quick & easy oat flour for baking as well. Nuts are rich in healthy fatty acids and phytochemicals. I have a whole basket in my pantry devoted to nuts! Eat a small handful of nuts as a snack, sprinkle over oat bran, dip in chocolate, add to greek yogurt, or even throw a few over your salads for a crunchy and satiating treat! The ultimate craving killer! With virtually zero calories and lots of fiber, cocoa raises energy, blunts hunger and reduces cravings like you won’t believe! Cocoa contains phenylethylamine (PEA), a compound that helps you feel satisfied and directly affects the pleasure centers in the female brain. I like to add 1 tablespoon to a mug with an optional non-calorie sweetener (stevia, truvia, xylitol,etc) of your choice, pour hot water on top, stir and voila, you have the worlds best diet aid! Baking is definitely not something that you have to live without while trying to loose fat and gain health. You just have to be smart about your baking mediums by ditching the sugar and processed white flours. When baking for fat loss, you need to choose ingredients that will help you meet your goals, while still allowing you to enjoy the comforts of homemade baked goods. Coconut flour is an excellent option for baking cakes, muffins, pastries and breads. Coconut flour is gluten free, low in carbohydrates and high in fiber & protein; making it an ideal candidate for those of us living a fat-loss lifestyle. When it comes to healthy baking, almond flour (or almond meal) is fantastic as well. Almond flour is made up of finely ground blanched skinless almonds. Almond flour gives baked goods a rich, nutty flavor and is perfect for quick-breads like pancakes, muffins and nut breads. Sure, sugar may not be illegal, but studies have shown that it can be more difficult to get off of sugar than cocaine! Although it’s considered harmless in comparison to most drugs, sugar, in excess, can cause a host of problems for a lot of us: cravings, binge eating, weight gain, heart disease and more. Whenever possible, I like to use sugar alternatives like stevia, xylitol, or other all natural, low-glycemic index sweetener options. Unsweetened coconut flakes and coconut oil are two staples in our pantry. Great for baking and making fat loss friendly treats as well as seasoning main dishes, etc. Coconut oil is one of the few foods that has been called a “superfood” and its unique combination of fatty acids can have profound positive effects on health. This includes fat loss, better brain function and various other amazing benefits. The number you are left should be low. For fat loss, the lower the better. Negative numbers are best. Even when it’s not “pumpkin season” I love to have some canned pumpkin on hand. Whether I’m mixing this into Greek Yogurt, a protein shake, pumpkin chili or using it for baked goods, pumpkin is a great way to add some fiber and complex carbs to give me energy all day long. Pumpkins are low in saturated fat and calories, are high in fiber and are very low in cholesterol and sodium. They are also chock full of vitamins and minerals such as: Vitamin E, Vitamin B6, Folate, Iron, Magnesium, Vitamin A, Vitamin C and Potassium. Not to mention, they’re pretty darn tasty too! When you purchase your canned pumpkin puree, make sure it is 100% pumpkin puree and not pumpkin pie filling. There is a HUGE caloric and sugar difference between the two. 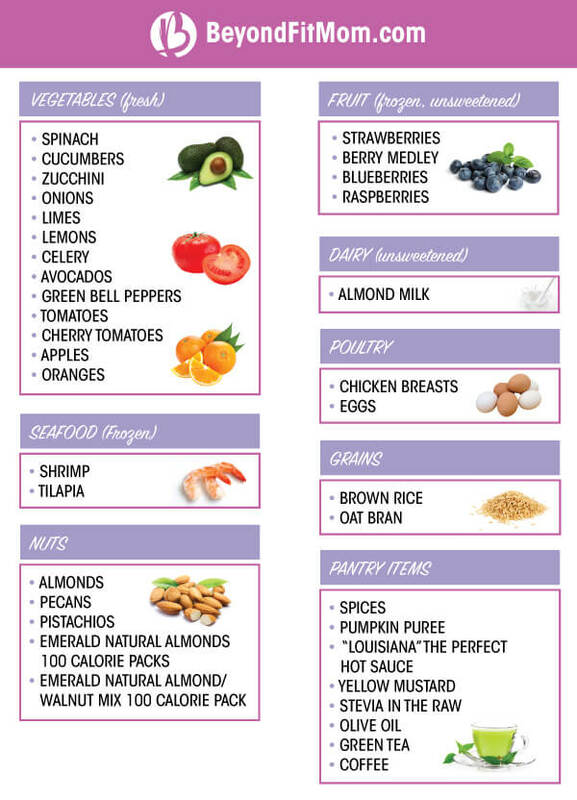 Need some more ideas for YOUR healthy grocery list? Here’s my healthy grocery list for the week. Are you a busy mom who loves the idea of quick & efficient workouts but doesn’t know where to start? Check out the BeyondFit Life Club, designed exclusively for YOU! Hundreds of women have transformed their bodies in less than 3 hours/week using my proven female fat-loss workouts that are NEW each month to keep your body challenged and to burn more fat than you ever thought possible! Plus you get access to my own personal recipes, exclusive insider fat-loss tips & tricks, and more! Research shows that people who start a nutrition program with a buddy are much more likely to succeed in sticking to it! So right now, share this article with three friends and invite them to join you on the 7 day Jump Start! Click HERE to Join BeyondFit’s 7 Day Jump Start for FREE!